Buyers and sellers engaging in the cross-border sale of goods are well-advised to be conversant with the United Nations Convention on Contracts for the International Sale of Goods (CISG), which governs international sales contracts. The CISG has been ratified by 89 states, which together account for over three-quarters of all world trade. 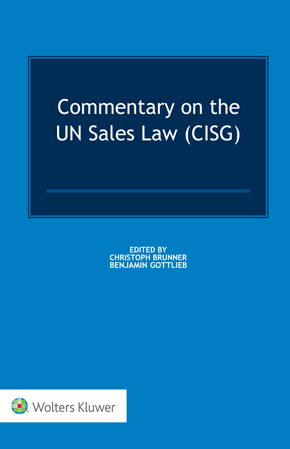 This practically-oriented, article-by-article commentary on the CISG will be useful to legal practitioners, counsel and arbitrators dealing with international sales contracts. • termination of contract and its consequences. This book is an updated translation of the second German edition of a valued resource in Germany, Switzerland, and Austria, and an authority regularly cited by the Swiss Supreme Court. The commentary is influenced by legal authorities from both civil law and common law backgrounds. Throughout, the contributors refer to the cisg-online.ch database, enabling users to locate decisions easily. User-friendly, focused on practical questions, concise but comprehensive, this article-by-article commentary provides a quick and trenchant overview of existing legal opinions and court/arbitral decisions. It will prove immensely valuable to legal practitioners, facilitating their formulation of reliable solutions to legal problems involving the CISG.